This is a crock pot brisket recipe that uses cola to flavor and tenderize the meat. The end result is a ridiculously easy beef brisket recipe that’s not only delicious but will feed a hungry crowd. Perfect for your next family gathering. Serve this one over mashed potatoes. For such an ordinary cut of meat, once brisket is cooked, turns into an extraordinary meal. And it’s perfect for feeding a crowd on about any occasion. Sunday football parties, dinner for friends, or as an easy meal to transport to a neighborhood pot luck. A large brisket will cook low and slow in the oven in a roasting pan, a smaller brisket fits nicely in a Dutch oven, and a crockpot will produce a beautifully tender cooked brisket. Your house will smell wonderful with the long slow cook, no matter which method you choose. When you buy a brisket you are faced with a choice of cuts. The flatter cut is referred to as first cut, and the second cut is is thicker and sometimes labeled “point.” I have purchased both and can’t tell if one is better than the other. They both cook beautifully. Leaving the layer of fat on the brisket helps keep the meat moist and tender. You can easily scrape it off after the meat is cooked. If you’re looking for a leaner and less greasy sauce, trim all but about 1/4 inch of the fat off the meat before you cook it. You need a little fat to keep the meat flavorful and tender. Make sure you choose a pot that has a good fitting lid. Or use heavy duty foil that will seal nicely around the pan. I use foil when I’m cooking a larger brisket in a roasting pan. You can cover the brisket about half way with liquid. This is called braising. More liquid than that and you’re officially stewing instead of braising. For this crock pot brisket recipe, we’ll be covering the meat with liquid for low and slow stewing. I’ve never smoked a brisket so I can’t address this method with confidence, but my friend Larry gives some great tips in his post about Poor Man’s Surf and Turf with Hot Smoked Brisket. To marinade is to soak food in a seasoned and sometimes acidic liquid before cooking. The desired results are to tenderize and flavor…especially when working with tougher cuts of meat. For this beef brisket recipe cola is used to accomplish both tenderizing and flavoring. Coke is often used in steak and chicken recipes to infuse a sweet and acidic flavor. Even though this recipe does not call for a long marinade before cooking, the acid in will help to tenderize the beef brisket as it cooks long and slow in the crock pot. Enough technical talk, let’s take a look at this slow cooker brisket recipe. I hope you give this Crock Pot Brisket Recipe a try. and if you do, please come back and give the recipe a star rating. And please leave a comment about your experience with this recipe. I love hearing from my readers. 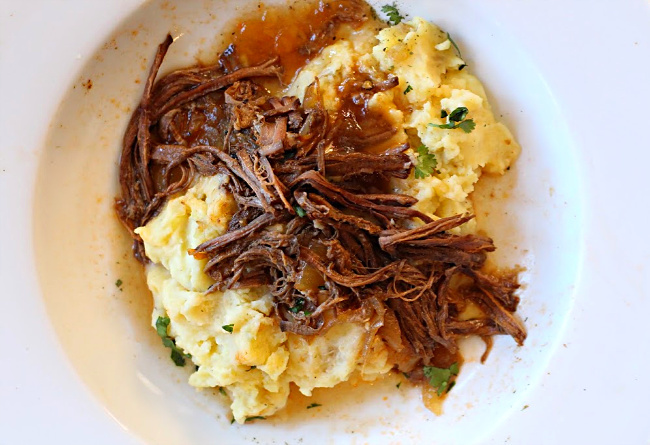 And if you have a favorite crock pot brisket recipe, let me know, I’d love to give it a try. 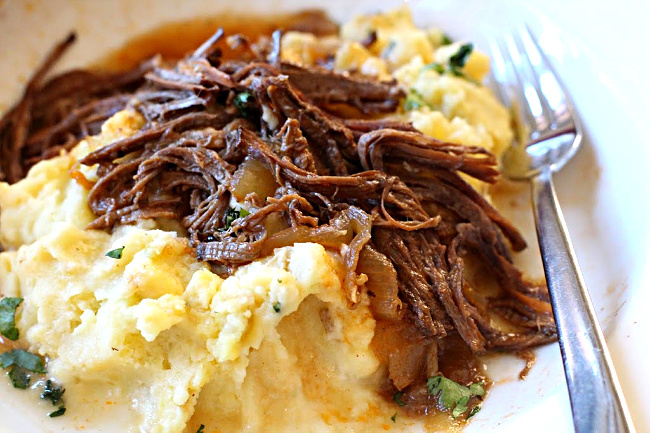 This is a crock pot brisket recipe that uses cola to flavor and tenderize the meat. The end result is a ridiculously easy beef brisket recipe that's not only delicious, and will feed a hungry crowd. Perfect for your next family gathering. Serve this one over mashed potatoes. If you have a removable stove top slow cooker insert, heat the insert over medium high heat. Add 3 tablespoons vegetable oil. When oil is hot, sear brisket on both sides until browned. Remove to a plate and add slices onions. Cook onions for about 3 minutes, stirring often. Add brisket back into the pot and on top of onions. All all remaining ingredients to the crock pot. You won't need all of the cola but the meat needs to be almost completely submerged by the cola. Slow cook 8 hours or until brisket is fork tender. When the meat is done, remove to a large cutting board and slice against the grain, then shred. Keep the shredded meat moist by adding about a cup of the cooking liquid. This will also serve as some gravy for the mashed potatoes. Serve over mashed potatoes or as a sandwich on a Kaiser bun. Serve with a drizzle of BBQ sauce on top. Oh, this looks fantastic!! Seriously, I had just put brisket and coke on my shopping list for another recipe! YUM! I’ve never made a brisket in the slow cooker. I do pulled pork in it all the time, though, and this reminds me of that. Great dish — and wonderful pictures. Thanks! 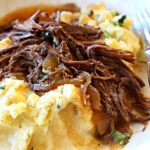 Lea Ann, we are big brisket fans so I was happy to see this simple recipe. Let me say that I learned from my Mom to slow roast brisket (covered) in the oven, which I did for years. But then a couple years ago I saw a recipe for crock pot brisket and tried it. Wow, I was so happy with the result. It was more moist and tender than the oven method. But I’ve never tried Coke over it so this will be my next recipe! I always marinate my brisket overnight, we like a smoky BBQ flavor and I highly recommend Claude’s or Gold Buckle smoke marinades, they come in a 16-oz. bottle. And, as you mentioned, do not cut off the fat layer until after cooking or it will be dry. Thank you for sharing your many awesome recipes! Looks fabulous! Brisket and short ribs have gotten so popular in past few years. I’ve never tried cooking one with cola yet so will bookmark this recipe to try. I used to love brisket! I still make a Jewish brisket when the kids come home. It’s always a hit. I have no doubt they’d love this one too! Wow! This is a ridiculously easy brisket and it looks so good. I’ve heard of braising in cola, but have never tried it. Maybe it’s time to change that.